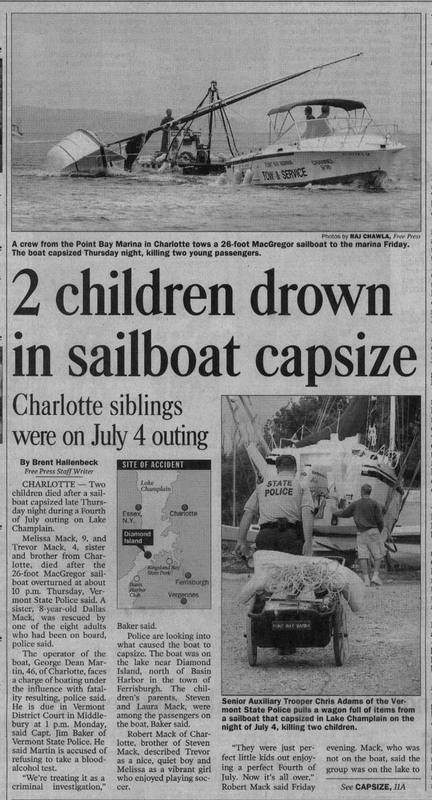 The boat that capsized on the Fourth of July and killed two children was overloaded and was being used incorrectly, according to the boat's manufacturer. The 26-foot MacGregor, which is a cross between a sailboat and a power boat, is designed to hold up to six people, according to Roger MacGregor, the boat company's owner. The boat carried 11 people the night of July 4. 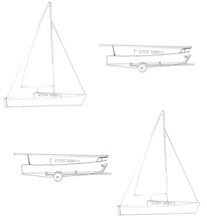 The boat's hybrid design uses a water tank on the bottom to provide stability. The tank should be filled when there are more than four people on board, MacGregor said. The tank on the boat driven July 4 by George Dean Martin was empty, according to the prosecutor in the case. The boat has no visible warning about needing to fill the tank, said the driver's lawyer, Richard Rubin. Martin does not own the boat and has driven it only three or four times, Rubin said. Martin's brother-in-law owns the boat and keeps it at Martin's home, Rubin said. The boat capsized about 10 p.m. on Lake Champlain in Ferrisburgh. Nine-year-old Melissa Mack and her 4-year-old brother, Trevor, drowned. The accident left the community wondering what caused a boat on calm waters to suddenly capsize. Martin, 46, of Charlotte, pleaded innocent last week to a misdemeanor charge of boating while intoxicated. He has not been charged in connection with the children's deaths. Addison County State's Attorney John Quinn said the investigation is ongoing to determine if Martin's alleged intoxication contributed to the accident. The MacGregor 26 does not have a heavy, permanent keel like many large sailboats. The lack of a keel allows the boat to move quickly when used as a power boat and makes the boat light enough to be towed behind a car. Instead of a keel, the boat has a large water tank that can be filled to stabilize the boat. When the tank is empty, the boat will not right itself if it tips over. With the tank filled, the water acts as ballast and is designed to pull the boat upright if it starts to tip, just like boats with conventional keels. The MacGregor company, based in Costa Mesa, Calif., and a number of MacGregor owners in Vermont doggedly defend the boat as completely safe if used correctly. "As long as you're doing what you're supposed to be, you're safe," said MacGregor owner John Gaudette of Post Mills. "It's like anything. If you don't know what you're doing, something is going to happen." The boat The water ballast tanks on the boat Martin was driving were empty when the boat was brought back to shore, Quinn said. Boats need ballast on the bottom to keep them from tipping over. Ballast balances the weight at the top of the boat and forces the bottom of a boat back into the water. Boats with large, heavy keels cannot be driven fast. The MacGregor compromises by having a flat-bottom that can be filled with 1,400 pounds of water. The owners can choose a fast boat with an empty tank or a slower, more stable boat with a full tank, depending upon their activity for the day. The front page of the MacGregor 26 instruction manual says the boat can capsize if the ballast tank is empty. The manual also says the boat's capacity is six people. "With more than this, the weight of the crew becomes very large in relation to the weight of the boat, and the stability of the boat might be compromised," the manual says. There is supposed to be a safety sticker on the side of the steering column warning the driver to fill the tank if more than four people are on board. The sticker urges people to stay toward the rear of the boat and to avoid sitting on the deck when the tank is empty. Passengers on the boat Martin was driving were sitting on the deck when it tipped, according to passengers on the boat. Roger MacGregor said all MacGregors made after 1997 should have that sticker on the steering column, along with other safety stickers. His inspection records for the boat Martin was driving show that the sticker was on the steering column when it left the plant. The boat is a 2000 model. That sticker was not on the steering column of the boat as it sat in a Charlotte marina Thursday. In its place was a sticker warning the driver not to put the boat on the trailer unless the ballast tank is empty. MacGregor said he did not know why the sticker about filling the ballast tank was not next to the steering wheel. Because the stickers are not permanent, MacGregor said he stresses the safety instructions in the manual over the stickers. Martin's lawyer, Rubin, said the absence of a warning about the ballast tanks posted on the boat is significant. "There's nothing on the boat that warns the operator that the boat is unstable without ballast with more than four or five people on board," he said. Loyal owners MacGregor owners in Vermont raced to defend their crafts when news of the accident spread. "The boat, when operated properly, is absolutely safe," said Dave Hill of Grand Isle, who owns two MacGregor boats. He keeps one in Florida and another moored by his home. Keeping the water tank filled is the difference between sailing safely and disaster, he said. He said he was once in high winds on Lake Champlain with his full sails up. A gust brought the boat over 90 degrees so the main sail was in the water. "It popped right back up," he said. His ballast tank was full on that trip. "If you turn it on its side and the ballast tank is empty, it's gone," said Hill, 63. "There's no kidding around about that." Hill said he sees the water ballast as a safety feature. If he's sailing and is caught in bad weather, he said he'll lower the sails and empty the tank to motor home as quickly as possible. The MacGregor's water ballast system is the key component in the boats' appeal, according to the company and boat owners. The option of draining the ballast means the boat can move much more quickly than boats with keels. The MacGregor 26 can handle up to a 50 horsepower engine, giving the boat just enough speed to pull a water-skier. The company says the boat can move at more than 20 miles per hour. An empty ballast tank also makes the boat light enough to pull on a trailer behind a car. The owner can save money on dock space by keeping the boat in a trailer all season, or can move the boat easily from one lake to another. Criminal case Police who responded to the scene of the Fourth of July accident wrote in court papers that Martin was acting intoxicated and failed a number of sobriety tests. Vermont State Police Senior Trooper Christopher J. Campbell wrote that Martin took a breath test that showed his blood alcohol level was .217, which is more than twice the legal limit of .08 for driving a boat. Martin later refused to take another breath test at the police barracks, the court papers said. Police cited Martin that night for boating while intoxicated with death resulting. The charge was reduced by Quinn to boating while intoxicated. Quinn said he has no evidence to connect the accident or the children's deaths with Martin's alleged drunkenness. "You can be perfectly sober and overload the boat," Quinn said. "You can be perfectly sober and not load the ballast tank. You can be perfectly sober and do something stupid." Police are continuing to investigate the accident, he said. Martin could be charged with the children's deaths or with negligence, depending on what the police find. Witnesses to the accident said they do not know what tipped the boat over so suddenly. Martin had tied the MacGregor to a friend's boat to watch the fireworks at the Basin Harbor Club on the Fourth. When the show ended, the 11-person crew and their two dogs spread out across the boat and settled in for a ride back to shore. Martin started moving the MacGregor away from the other boat while the two were still attached, according to the other boat's owner, Julie Welch, of Shelburne. She told him to stop, they unhooked their lines, and Martin motored away, she said. She is sure their lines were completely off each other's boat when he left. "The next thing I know, my kids were screaming that the boat was going over," she said. "It was just bottom up." Adults from the MacGregor searched the water and were joined by rescue workers and other boaters. 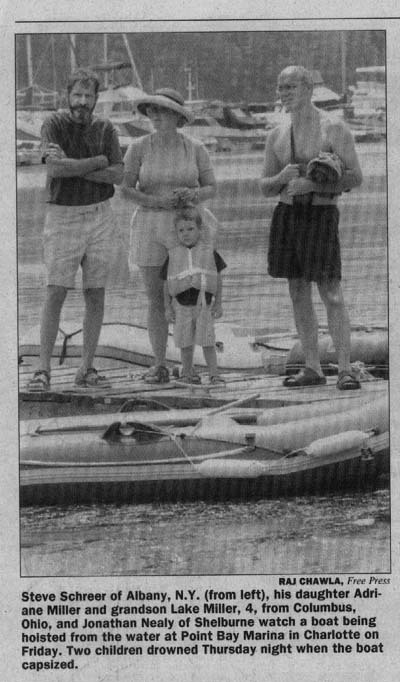 They found Melissa and Trevor wearing their life jackets, tangled underwater in the boat's lines. Their sister, 8-year-old Dallas, was in the boat's cabin when it capsized. She was found floating in an air pocket inside and was pulled to safety. All the adults onboard swam safely to other boats. Welch said she thought Martin had been drinking, but couldn't tell by talking to him how much he'd had to drink. Welch said she is devastated by what happened. "I haven't been down to my boat since," she said. "I probably will never go on my boat again on the Fourth of July."